Chris M. "Matt" Dillon is a seventh generation Texan who can trace his Texas roots back to his great-great-great-great-great grandfather, Gordon C. Jennings, who perished defending the Alamo. Chris was raised in Bastrop, Texas, and graduated from Bastrop High in 1990. Unable to resist the urge to continue being a Bear, Chris attended Baylor University (now Texas State University) where he graduated with an M.B.A in 1996. While working towards his MBA, Chris worked full-time, first as a substitute teacher in Bastrop ISD, then as an analyst with the Texas Workers' Compensation Insurance Fund, and then as a tax examiner with the IRS. Realizing a dream first echoed at the ripe old age of 12, Chris was accepted into law school and began his course of study in 1997 at St. Mary's University School of Law. Chris earned his doctor of jurisprudence (J.D.) a full semester early and graduated in 1999. While at St. Mary's, he received a Certificate of Completion for The Program Studies on Global Legal Issues at The University of Innsbruck, Austria in 1998, under the direction of his St. Mary's professors and the Chief Justice of the United States Supreme Court, Honorable William H. Rehnquist. Chris was admitted to the State Bar of Texas in may 2000. In his first year as a lawyer, Chris served as an appellate briefing attorney for the Seventh Court of Appeals of Texas located in Amarillo, Texas, under the direction of Honorable Justice Don H. Reavis. Chris had also previously served as a legal intern for the Honorable John T. Boyd, Chief Justice of the Seventh Court of Appeals of Texas in 1998. 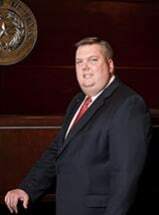 Upon completion of his one year commitment with the court, and in true country lawyer fashion, Chris returned to Bastrop and opened a private law practice where he continues to work to protect the civil liberties of individuals from all around the state of Texas. Chris has also served as the general counsel for the Lost Pines Golf Club in the historic Bastrop State Park. Chris M. "Matt" Dillon, Lawyer, is based in Bastrop and represents clients throughout Texas.